When I leave my driveway, I see the top of Etna. I live at 3,000 ft, and Etna is another 7,000 ft. high. As you can see, there is a lot of snow on it in winter. Leaving town and heading down the volcano, I look to my left, to the east, and often see a beautiful sunrise like this with a hillock from an ancient volcanic eruption in the foreground. All the way down, I have glimpses of the Mediteranean Sea with the rising sun shining on it. This is the Bay of Catania. 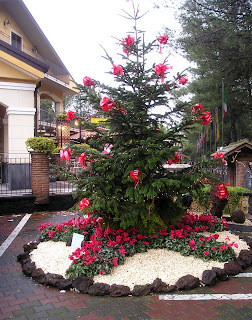 It's looking more and more like Christmas at the Bar Papaveri Papere (The Family Duck Bar to us) in Nicolosi, where my friends and I gather every Sunday morning. 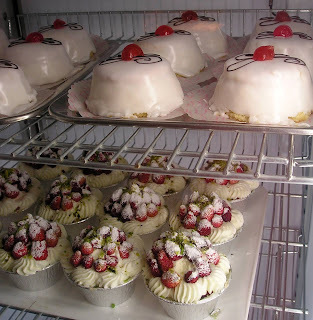 Not only do they have a big tree outside and beautiful pastries inside, but it even snowed today! 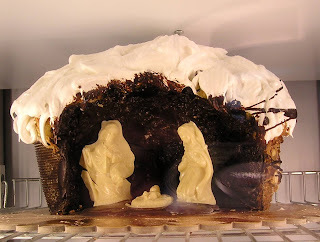 Check out the chocolate Nativity cake and Yule log cakes above! Rick Steves, my favorite travel writer, released a new article about Sicily on CNN.com called "Sassy, Spicy Sicily." I think he does a remarkable job of capturing what I consider to be some of the charm of Sicily in this short article. He writes: "If you like Italy for its people, tempo and joy of living -- rather than for its Botticellis, Guccis and touristic icons -- you'll dig Sicily. "Sicily, standing midway between Africa and Europe, really is a world to itself. On this spirited island, in spite of Italian government and European Union pressure, the siesta persists and motor bikers' hair continues to fly in the Sicilian wind." 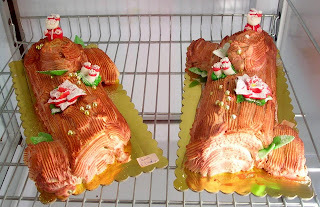 He writes about the Capuchin crypt in Palermo, the view from the top of Etna, Cefalu, and Vespa-worship, ending with this description of an old fisherman in Cefalu: "Since the 1950s, Il Presidente has spent his nights fishing, gathering anchovies under the seductive beam of his gas-powered lampara. As he takes the pre-Coleman stove vintage lamp off its rusty wall hook, I see tales of a lifetime at sea in his face. As he shows me the ropes he wove from local straw and complains that the new ropes just aren't the same, I lash him to the rack of memories I'll take home from Sicily." As if a trucker strike and gas shortage weren't enough, these poor guys dumped an entire truck of fresh oranges right outside of Sigonella's NAS I today. 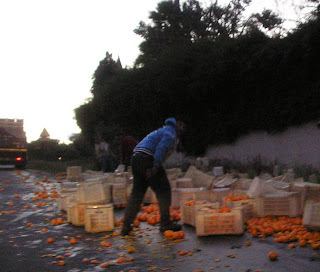 Oranges were rolling down the gutters for about half a block! By the way, the strike is now over and things are starting to roll again. More stations open, more cars on the road, speeders out speeding. 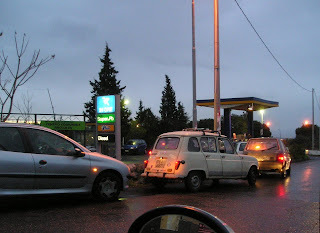 Trying to Get Gas in Sicily! Here are some photos I took on the way to work this morning, before 7:00 AM . . . people trying to get gas. The strike is supposed to continue for another two days, and even then, when will we have fully-supplied stations? Just Try and "Fill It Up!" Nonetheless, I took the message seriously and replied that luckily I had filled up yesterday and was good for at least 350 miles in the Mini on 40 liters. PAO (Public Affairs Office) has just received word that Italian truck drivers have begun a five-day truck strike against high fuel costs. In Sicily, strikers are blocking all trucks trying to embark ferryboats at the Messina and Palermo ports, forcing motorists to slow down. The strike is also preventing cargo from being delivered at the Catania port. According to Catania police officials, trucks are also currently lined up at the San Gregorio tollbooth (A-18 Catania Messina highway). 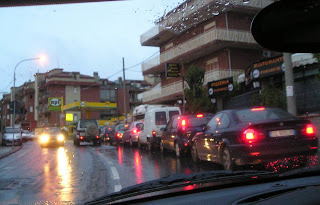 Truckers have also announced that they will set up blockades at other key points across the island." My friend Kendra, who usually comes to school on A-18, had reported yesterday morning that truckers were blocking the toll booths. She has already begun an alternate, non-autostrada, route to and from work over the volcano. On my way home this evening, I passed about six gas stations, and all but one were already closed, probably out of fuel. 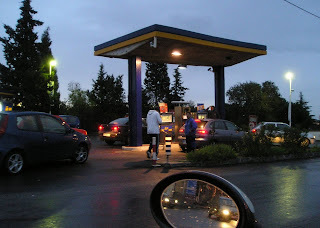 The one that was open had at least twenty-five cars lined up to get gas at their one little pump. That's where I was yesterday, thank heavens. What's the problem? Truckers are protesting the high price of gas. Italians are always striking, but this seems to be the first serious one I've witnessed in 3.5 years on the island. They should protest--I don't know what diesel costs (it's cheaper than gasoline), but regular gas for Italians is now $7.50 a gallon! Of course, that's computed on the value of the rapidly declining dollar. But even we government-employed civilians using gas coupons purchased on base have to pay $3.75 a gallon now! None of this seems to stop or slow down the Sicilian drivers who still race around like crazy, passing everyone and everything in sight. Perhaps they'll all be reduced to Vespas eventually. Sicily will once again be the island of the bees.